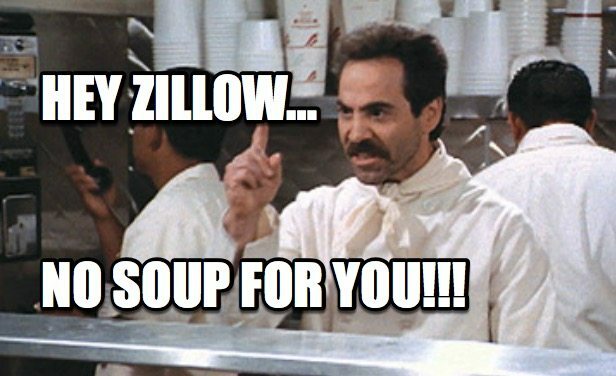 Hey Zillow! No Soup for YOOOUUU! Did you see this nonsense Zillow pushed out recently? In a nutshell, they are piloting a program that boasts a homeowner can sell their home quickly through Zillow’s own custom service. Only to go and throw their hat into the ring with their own “solution” to selling homes, it REALLY grinds my gears. Especially when said company does NOTHING to win the actual listings that are “leveraged” to generate leads, and then immediately sells those “leads” back to agents. It’s kinda like lending your mooch friend your prize car for a few months, who then uses it to run his brand new Uber business, and then he makes you pay for all gas, tolls, tickets and maintenance. And by the time you get it back, you find out he’s been hanging out with your spouse (OK that 2nd part has nothing to do with anything, but it’s a good reason to hate Zillow even more). Any Seinfeld fans out there? For those who are, this will make perfect sense. Of course if you haven’t ever seen the “Soup Nazi” episode, let me sum it all up for you (and watch this funny clip below too). All you need to know is that the Soup Nazi was an expert at kicking out customers to the curb who didn’t meet his expectations. And for us, that means giving Zillow and everything they stand for the final boot (if you haven’t already, what are you waiting for!?). Because the truth is, YOU DON’T NEED THEM and you never did! Why pay a fortune out of pocket for garbage, recycled leads when you can start generating them yourself? Why reward Zillow with anything when they dun nuttin’ for you my friend (except throw out some terrible home values to confuse your clients even further). Of course, you cannot control what Zillow and other big name companies do, but you do have 100% control over your own database and your future. 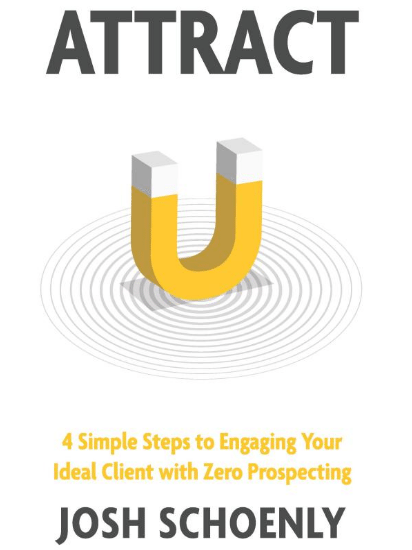 Which is why we believe so strongly in the “Client Alchemist Way,” because it is your ticket to breaking free from the lead vendor trap so that you can finally call the shots. And when you do, you’ll build an email list of future clients and referrals that Zillow can NEVER touch. The future is online…the future is in your email list. The question is, what will you do NOW to prepare for what is coming? 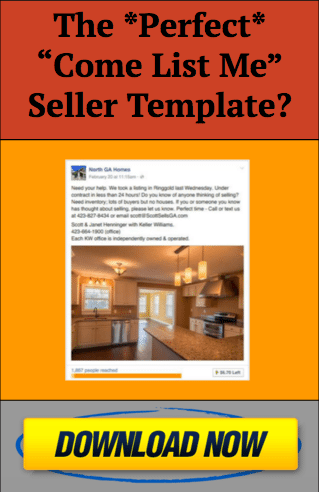 Sick of Zillow, Trulia (& the like) stealing your leads only to try and sell them back to you at RIDICULOUSLY expensive costs? Ready to beat them at their own game & take back control of your business once & for all? If so then go ahead & grab a copy of our Amazon Bestselling book ATTRACT – RIGHT HERE. ← 7 Listing Appointments & 1 NEW Listing in Under 5 Days?